Feb 20, 2011 Transducer Techniques has featured an economically priced load cell system comprised of our popular MLP load cell and DPM-3 Digital Panel Mount meter. This system is suitable for a variety of OEM force measurement and industrial or laboratory weighing applications. The DPM-3 can be scaled to a full five digits, samples 60 readings per second, and features true peak reading capability. Available options for the DPM-3 Digital Panel Mount meter include dual relay capability, analog output, and serial communications. The MLP load cell is a tension and compression load cell constructed from stainless steel or aluminum alloy and offered in a variety of ranges from 10 pounds to 1,000 pounds. 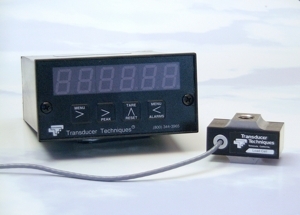 Accuracy specifications are consistent with high quality strain gage based load cells.